These guidelines have been prepared on the basis that most product uplift operations are outsourced to specialist uplift contractors by clients who encounter them infrequently. For the former, they identify hazards and necessary control measures, including specifications for appropriate equipment, and set out good practice, whereas for clients, they provide information that will help them understand the operation and set out necessary organisational and work control arrangements. Following the guidelines should safeguard the health and safety of people, including employees and the public (such as neighbours), adequately protect the environment, and minimise risks to assets. Therefore, the guidelines are intended for use by both uplift contractors and clients that commission them. The guidelines provide good practice, rather than a set of rigid rules, based on satisfactory experience in uplift operations and so are necessarily generalised. The 2nd edition guidance has been significantly reworked to reduce content and completely restructured to make the current 3rd edition less complicated and easier to follow. legislation: Construction (Design and Management) Regulations 2015, Hazardous Waste (England and Wales) Regulations 2016. 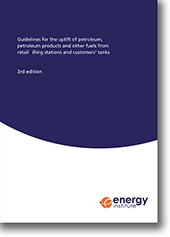 The scope of these guidelines includes the uplift of petroleum, petroleum products and other fuels from both underground and above-ground storage tanks at filling stations and industrial customers’ sites.